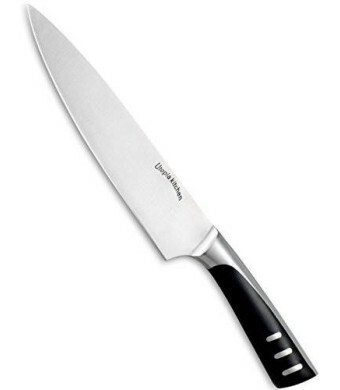 QUALITY MATERIAL - 8-inch Chef's Knife is made from 100% Stainless steel blade. DURABILITY - Tarish-resistant, rust-resistant, and easy to clean Stainless steel blade. COMFORT GRIP - ABS+430 handle allows for easy grip and hassle-free maneuvering. Double blister card with exposed handle. LIGHTWEIGHT - Conservative blade thickness and elite design allow for easy handheld use. 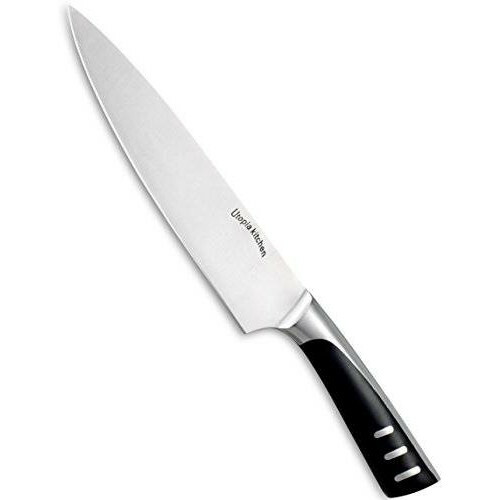 Top-Rated Kitchen Knives! For safe, durable, and quality blades that don't dull easily, the Utopia Kitchen Knife line is your ticket to cooking with ease. For food prep at home or in the commercial restaurant kitchen, the 8 Utopia Stainless Steel Chef's Knife cuts through legumes, fruits, meat, bread, and baked goods without unnecessary hacking and sawing. Easy-to-use and durable, this Stainless Steel knife is tarnish-free and rust-resistant, and will stay sharp through many uses. A perfect multipurpose kitchen tool for any home cook or professional chef. If you are not satisfied with the 8 Utopia Stainless Steel Chef's Knife, just return them within 30 days for a full refund. No questions asked, no hassle. Scroll up to click the Add to Cart button. 8 Utopia Stainless Steel Chef's Knife shipped today.